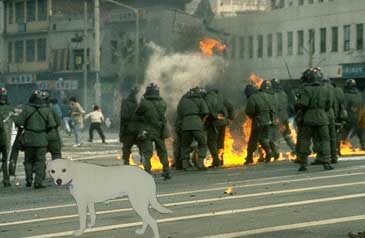 A photo, believed to be Sunny, escaping the scene of a riot in Seoul, South Korea in 1992. PHOENIX - Sheriff Joe Arpio expressed measured optimism today in this city's efforts to halt the costly and disruptive rampage by a suspect known only as Sunny. The recent focus of attention is the destruction of shoes, furniture, and landscaping. This adds to a longer list of offenses which includes public defecation. In a bizarre twist, Law enforcement agencies warn Sunny now approaches strangers and licks them. ''Sunny spent her early years behind bars'', says Director Ben Spayed of the local pound. ''Roughly eight dog years. Unusual behavior is expected in these cases''.